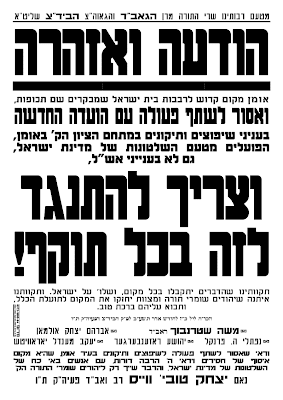 Read all about א ירושלימ'ער אינגל, א רבי'ש קינד, who became a fiery Zionist and stuck his tongue out at all the zealots. I wonder if that could happen today. 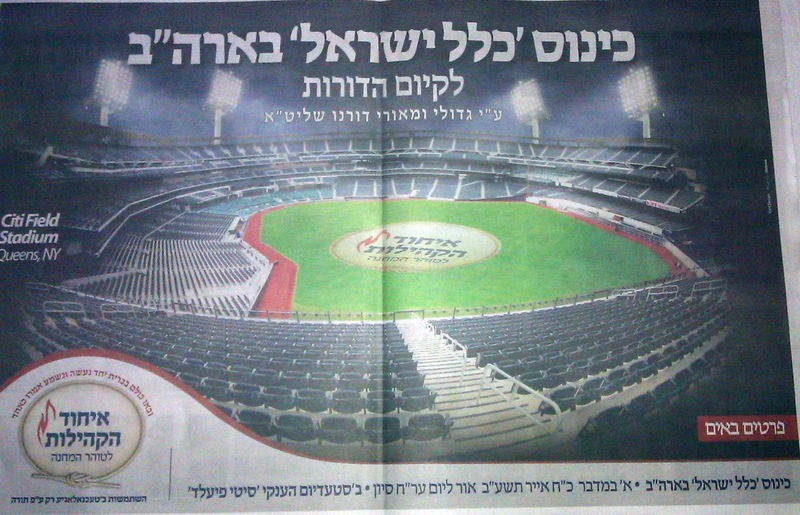 "מכתב על מרן הראי"ה זיע"א"
Many of you complain to me why I don't write about this and that, whatever it may be. I welcome and appreciate such ideas and suggestions. It means you're listening and watching and are active in the discussions. 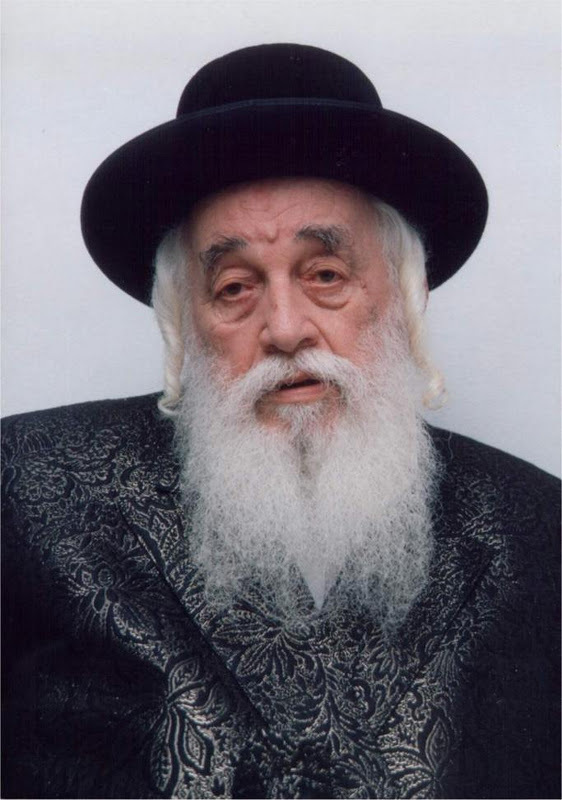 Last week, after the Vizhnitzer Rebbe passed away, I got a "sharfe" email from a Lubavitcher yungerman ( I think he's married...) He was upset that I didn't write about the sudden passing of HaRav Reb Yitzchok Zirkind, ע"ה of Crown Heights on 18 Adar. 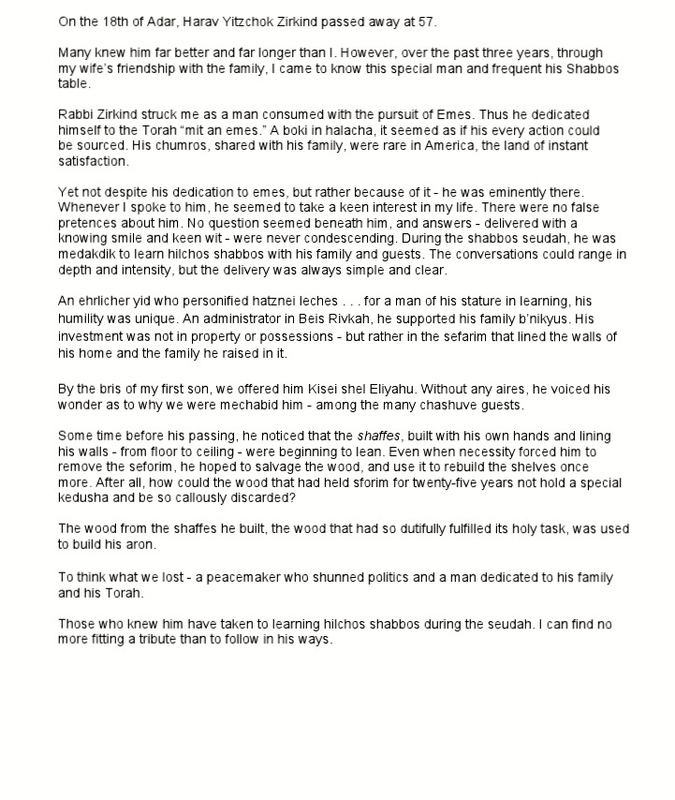 The truth is I didn't have the time to write about it, and I thought that just posting a picture with a few words copied from one of the illustrious unofficial Chabad sites... will do him no justice. And then time marches on, pushing it down the proverbial "totem pole." So is the way of the world. The world of blogging, anyway. 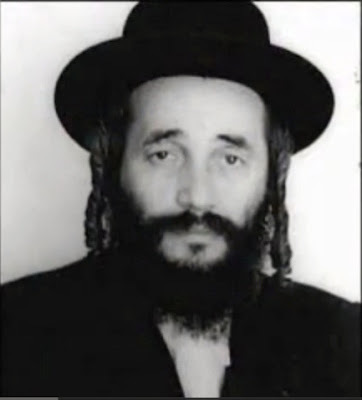 Reb Yitzchok Zirkind was someone I saw but never got to know. You might find this surprising, but I'm b'teva very shy, which means I never just approach people, even if they're public figures and expect to be bothered by complete strangers. Edited for clarity, grammar and vechulu. Here goes: That's it? 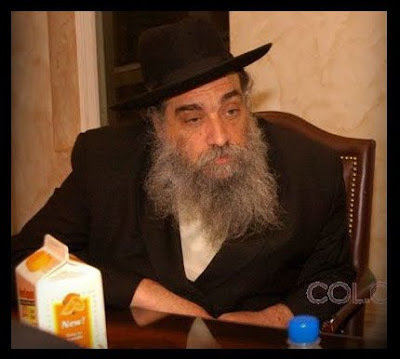 unzere aigene (Harav Zirkind) does not matter, only the groise Rebbes and gedolim (Reb Michel Yuda Lefkowitz vekadoime, and now Vizhnitz) matter, ober unzere who cares?! 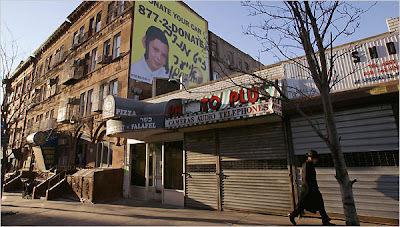 chutsh he was Lubavitch - you could cut and paste from the Lubavitch sites just like you could do benogea ale di andere. I understand you don't have time, but I'm sure it can come before you watch epes ah video from epes ah yidishist an apikores - [he means the Chaim Grade piece I put up then - HT] (don't get me wrong I loved it (he chatzi got chasidus, but he missed the whole omek (ubifrat kefi shemevuar al yedei chassidus chabad) that the whole choil is emes but is only emes being that it is durchgedrungen with shabbos. anyways). "You say I should write something, do you think that a yoshev ohel is allowed to have more time than someone who is osek in yeshuvoi shel oilam. If ye what is his amasla for not doing other things? fine saying strong words, its just that i have no experience in writing these things, which would mean I would have to take alot of time which I don't have. Ersht darf men endiken kama sugyos geruntig mit der richtige peshat (I know it sounds stupid as it seems that I hang around the web, however that is just a small percent of the time. and just ah shtikle to relax ah bisel.). You, however, have experience so it takes less time. Just a couple of peratim......... חסר קצת...... the nekuda is that his last act alive was with his beloved seforim, which his whole life was lilmoid u'lelamaid LISHMOIR VELA'ASOIS. Also, I promise you that he only got involved (in Crown Hts עסקנות - HT) leshem shamayim, to fix kashrus and to instill chinuch.] 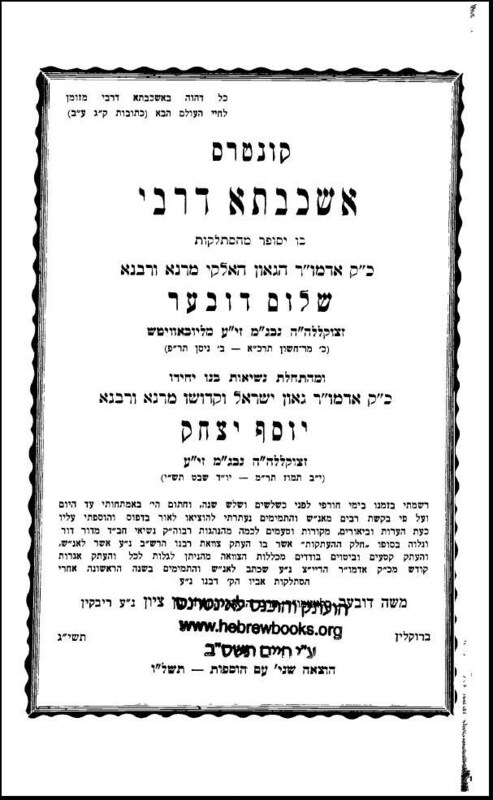 He was one of the Lubavitchers with whom one could be mefalpel in lomdishe inyanim and also where one could pasken halacha lema'ase, but with lomdus - and bichlal he knew. He was an amazing personality who has so much to himself. Stam, just to bring out who he was on a plain level; I heard that Benjy Stock has since said that it will take 3 people to replace him. He was a wonderful person who really cared about things, that people should learn good gemara, halacha. 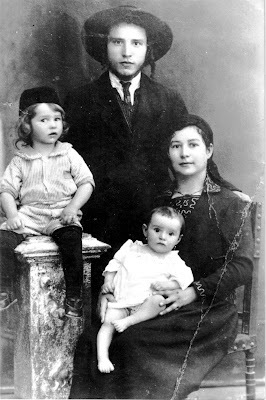 He had so much potential, left a wife and 9 children (8 unmarried kids).ער איז פשוט געווען א טייערער איד. He could speak to you in yedios in a lomdus in a sugya in halacha in teshuvois and in haintige sifrei pesak, ah shtikle ish ho'eshkoilois, but above all a gem. He had a geshmake humor with an intersante candor, but with a lovely smile (kemat cute). ah tzadik. here's the link to read it on HebrewBooks. 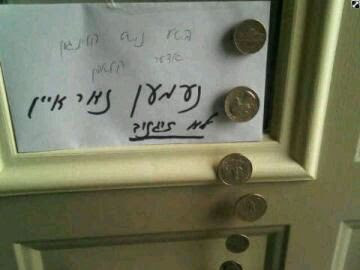 - ס'איז כדאי צו ליינען. Or, if you'd like, you can download it Here and read it whenever you like, even after the Internet is banned... The author, HaRav Moshe DovBer Rivkin, was a תלמיד ישיבת תומכי תמימים ליובאוויטש שבליובאוויטש and a ben-bayis by the Rebbe Rashab and later served as Rosh Yeshiva in Torah VoDaas in New York until his passing in 5737. Comments not particularly related to the book will be unceremoniously removed. There's trouble, trouble with a Capital T, in Uman, Ukraine. ס'גייט גרויסע קלעפ דארט, און עס ווערט נישט שטילער. What's happening is that there are very grandiose renovations being planned for Uman, stuff like hotels, shopping centers, etc. 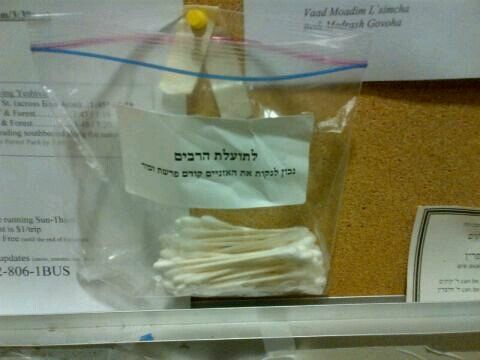 to cater to the thousands who visit there every year, and we're not just talking Rosh Hashonoh either. There are always people there these days. A YouTube search will show you that. There's also talk that the one of the Israeli Government offices, be it the Board of Tourism or some similar office, will begin to run things there. There are very prominent Breslovers that back it and there are those - no less prominent - that oppose it. We're talking ישוב הישן types here. And some of those who oppose it made their dislike known to the project's supporters by באנוצען זיך מיט הענט, ה"י. 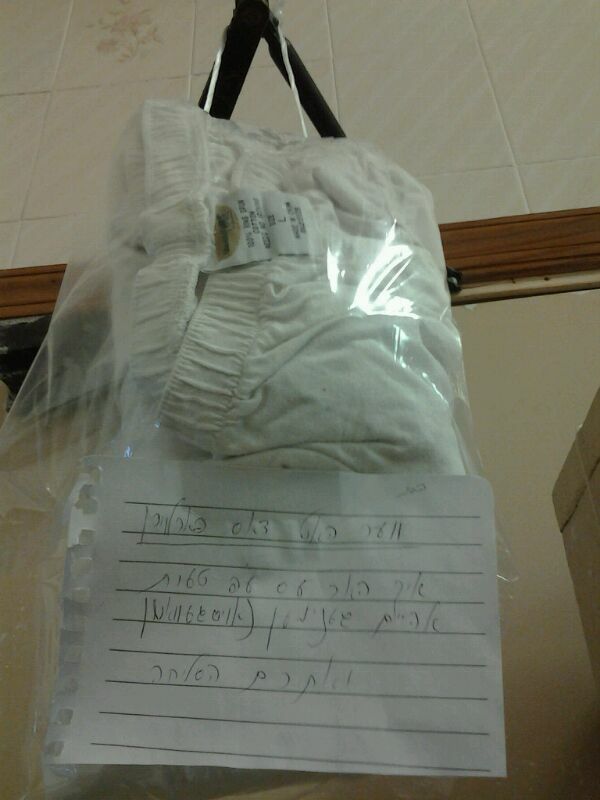 It seems like the fact that they got a tzetel from the Edah HaCharedis BaDatz allows them to stop it at all costs. It may be hard to believe,, but not all Breslov is Na-Nachs, etc. There's a core of קנאים that see their קנאות vs. The Jewish State as part and parcel of their "Breslovkeit." And then are those, no less frum and erlich, who don't see it as an issue at all. That sometimes happens when the Rebbe passes away during the Industrial Revolution - everybody believes that this is what the Rebbe would've said or done. 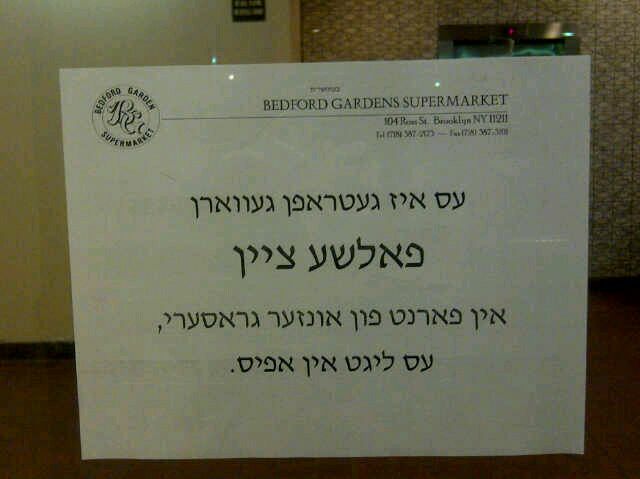 The question is why the BaDatz thinks it can tell people what to do in Uman. After all, this is a question that the local Rabbonim should handle, or at least Rabbonim within Breslov. I'm flattered that people look to me and to my writings to take comfort in the event of terrible tragedies, but what am I supposed to say at a time like this? What words of comfort can I possibly deliver? We sit and mourn יחד עם כל בית ישראל. I have a friend -or maybe "acquaintance" would be a better term? 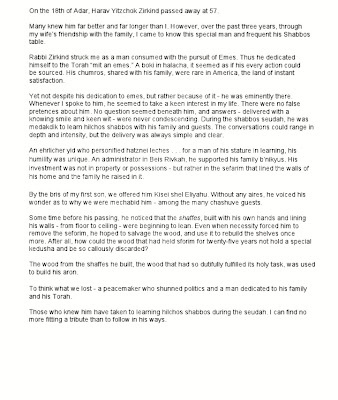 - from my Kolel days who's a Chabad shliach in Toulouse and was quoted in one of the reports. 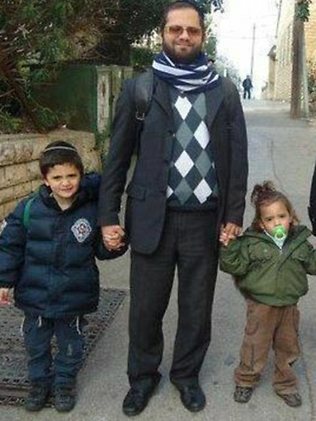 He had just dropped off his children at the school when he heard the shots. His daughter texted him to stay away from the school. Why do I tell you this? I have no idea. I'm just rambling. Rabbi Sandler was on shlichus in Toulouse, having come from Israel to teach. This is an unspeakable crime, especially since we know that the killer looked to kill children point blank. 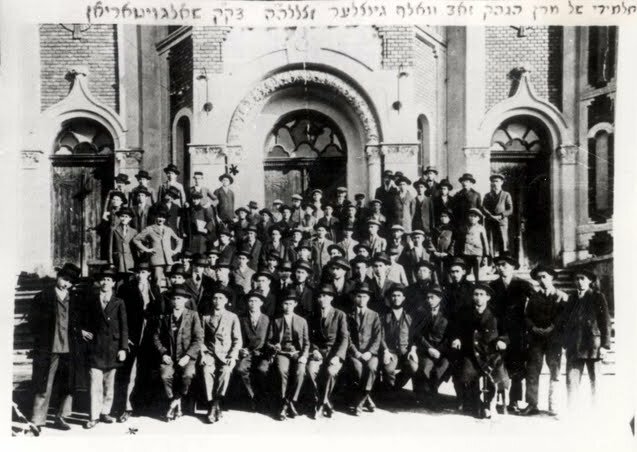 We can see from the pictures that the community in Toulouse is a united one, with many different streams all being educated either in Lubavitch or Otzar HaTorah. I have met Jews in Monsey who are French - not Chabad - and spoke so highly of Lubavitch and their activities. It warms the heart to see Jews united so. Let's do that here too! Here we have countless numbers of Jews who could easily assimilate in France yet choose to educate their kids in the ways of Torah, despite the dangers of it! What a beautiful nation the Yidden are! I'm tired of being the bearer of bad news here. Obituaries, one after the other. It's bad enough that I write about people, cities and culture that are long dead, now I need to write about killings, r"l? You want links? see below. You've heard and seen it all by now. Let's hear about good things happening!! דער בלאט" על האדמו"ר מויז'ניץ זצ"ל"
איין ג-ט ווייסט how much time and money and effort they're gonna spend on this. And it's gonna flop. Bad. There's no way in heck that they fill up that stadium. 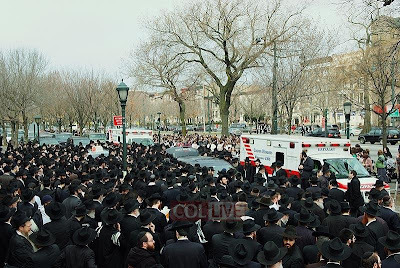 I appreciate the fact that RMS and the Skulener Rebbe want to save future generations for Yiddishkeit, but I think the short sightedness of many of these same people is what lost them this battle. They never believed it would come to this. They had built a very high wall, and no blackberry or Iphone would breach that wall. Now they're humming a very different tune. 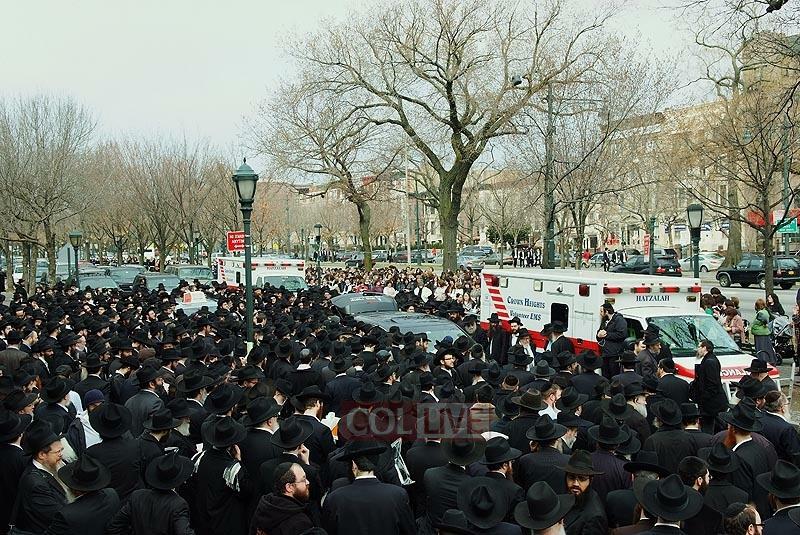 The driving force behind this gathering is one Rabbi Nechemia Gottlieb of Lakewood, who was once Menahel of of a Lakewood "Zilberman-style" cheder in Lakewood. Now he saves children from the evils and dangers of technology. I understand he's very persistent and gets his way or else. I wish I knew what he was thinking, first when he rented out Citi Field, and second what a few hours of lectures will accomplish. Will there be some kind of massive bonfire that all BBs will be chucked into? or will all mosdos force all parents to swear that they have no Iphone or internet at home? Or will crack squads be banging on your doors at 2am looking for Smartphones? For that we need CitiField? And how in the world will they fill up that place anyway? The last siyum haShas with all the excitement couldn't gather that many people together, and they had people bussed in from all over the US! And they think they'll fill CF?! See the first story on the "פסוק "זה יתנו. It's a doozy. Basically, all it took for the Palm Springs שליח to forego his scruples and מנהג המקום was a few dollars. And a Belzer Chossid was the one who made the Bobover Rov so happy. O' those Galitzyaners.ווען מ'דארף, קענען זיי ארבעטן צוזאמען. 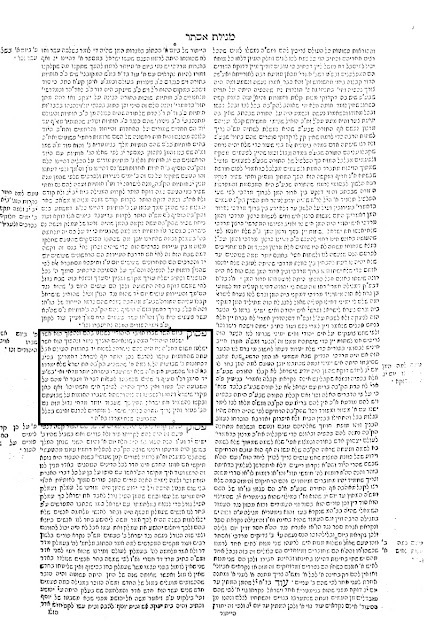 This piece from the זרע שמשון is what many of you may be looking for when pondering the question of "how were the Jews permitted to rise up against the nations of the world if they were under oath to G-d that they would not do so until Moshiach's arrival?" For some the whole YomTov is צושטערט because you cannot get the question out of your minds. You're enlightened and you can't see past it. 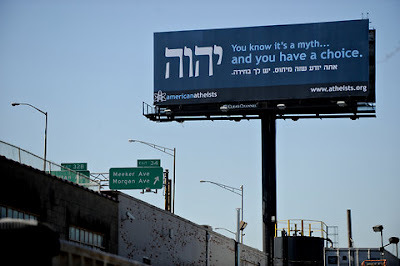 You listen to the מגילה and it bothers you! But fear not! This may put your mind to rest a bit. (There's also the fact that Jews killed Gentiles that bothers people these days, and many in Israel are refusing to celebrate what was once a very popular holiday even among the secular - but that's another angle. We're not here to pursue that here.) In the interest of "equal time" and being "fair and balanced," we bring you a response from the "Torah-true Jews against Zionism," who try and שלאג אפ this זרע שמשון, or rather show how this does NOT contradict their position that it is forbidden to rise up against the גויים until משיח comes. Here's a taste of what the left in Israel is thinking these days. Tongue in cheek, of course. I guess you need familiar with Israeli politics and culture to really get what they're referring to. I know that his kids and eyniklach are somewhat surprised - shocked, really, that this surfaced. They had heard that he burned it before leaving to Hungary, and that meant that it ceased to exist... But some very determined young man went and found it, and it didn't take much to get it. This is the world we live in. I think I heard R. Matisyahu Solomon refer to the computer as a metaphor for וכל מעשיך בספר נכתבים, that everything we do is פארשריבען for all eternity. Even if we think that we burned it. In the case of the Shoproner Rov it was as if he was running from this for the rest of his life. One might say that some of his extreme opinions were to compensate for all the חכמות חיצוניות that he learned as a child and as a young man. 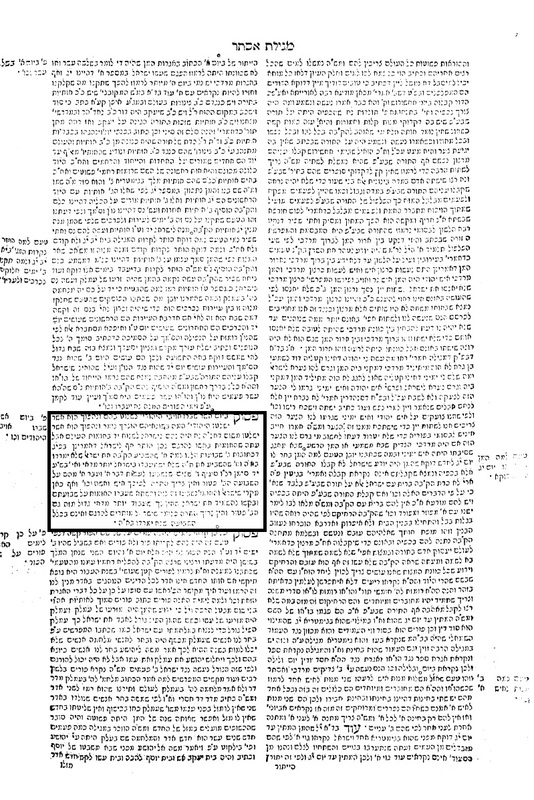 The page "Benutzte Literatur" (page 82 of 85) is a who's who of ספרים חיצונים. Heady stuff. Received via e-mail from "a friend": "The story goes as follows. 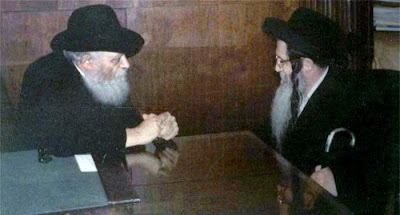 Someone told Reb Yechiel Yaakov Weinberg about Shoproner Rav's 'תורת א, to which he replied, "Who, Shimon Posen? I saw his doctoral dissertation and it was full of apikorsus." 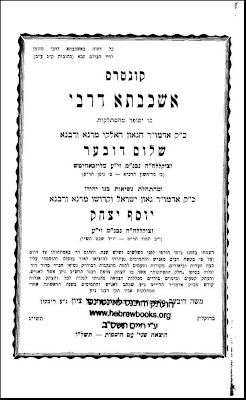 I heard the story from my friend b'shem his father be'shem the late R. Yitzchok Heilbraun z"l (if you know who that is, if not ask around about the Baal Koreh in the 7:00 o'clock minyan in Pupa Shul on Bedford Ave.) who heard that statement from Weinberg himself. This story makes perfect sense considering Rav Posen published the doctorate in Giessen, Gemany in 1921 and Weinberg studied at the time in Giessen under Paul Khale. What I can't figure out is, how come R. Posen studied in Frankfurt University, and published the dissertation in Giessen. 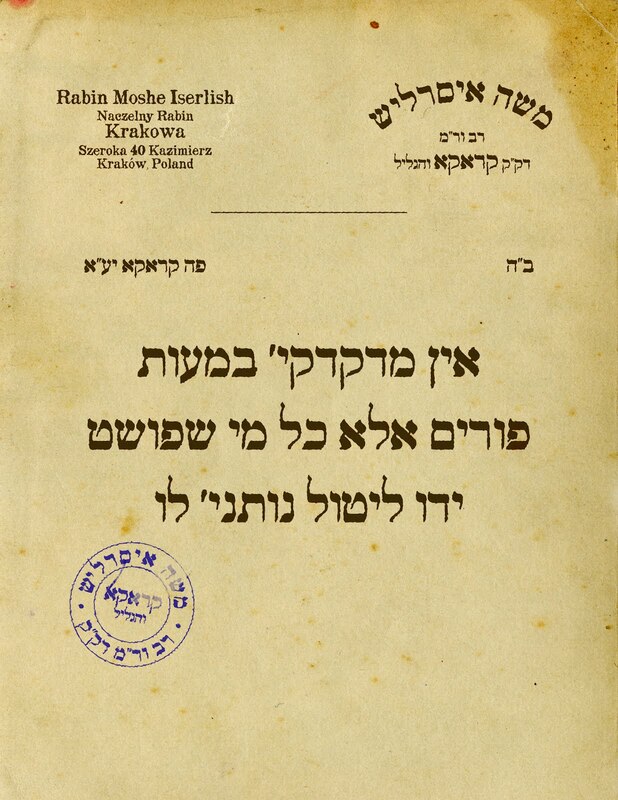 Also, check out the last 2 pages of the doctorate where R. Posen writes some interesting biographic details about himself that do not appear in any biography of him..."
As a bonus we bring you a few pages from RNK's MOAG where he discusses the Shoproner Rov as well as some of his contemporaries. Fodder for some good conversation, is what this is. Click on link and audio will start automatically. Clip begins in middle of Krias HaTorah for Taanis Esther. I'm not sure if the בעל קורא is the סאטמאר רב himself or not, but the מגילה is. Time with Reb Boruch Mordche Ezrachi, pride of Chevroner Yeshivah, son-in-law of the Mashgiach Reb Meir (Paritcher) Chodosh husband to Rebbetzin Shulamit Ezrachi and brother of Reb Yitzchok Ezrachi of DaMir, is always special. Some of you may remember the now-famous story that RBME tells where he thunders "יצחק אלחנן שמאלה" - this video, of a trip to Poland, is very special as well. This video was sent לזכות את הרבים by a very good friend of Circus Tent. בחור "עטערעס'ניק זה משהו מיוחד. All the negatives of חברונ'ער ישיבה without the positives. אזוי זאגט דער וועלט. NO MORE "ANONYMOUS" COMMENTS ACCEPTED FROM THIS POST AND ON. NO EXCEPTIONS!!! In the comments section click on "name/url" and write any name. Nobody will know who you are. Otherwise your comment WILL NOT BE PUBLISHED! אין עונשין אלא א"כ מזהירין, פלעגט דער מנהל אין חדר זאגען. כ"ק אדמו"ר ר' יעקב ישכר בער ראזענבוים זצ"ל איז אוועק נעכטן נאכט אין עלטער פון 82 יאר. ער איז געווען א זון פון אדמו"ר ר' חיים מרדכי ראזענבוים, א זון פון ר' איתמר'ל, דער "אלטער רבי" פון נאדווארנע.